Latkes break with the potato tradition and go for parsnips and celery root instead. The celebration of Hanukkah always includes something fried in oil, usually potato latkes. Parsnip and celery root are a good variation, though. 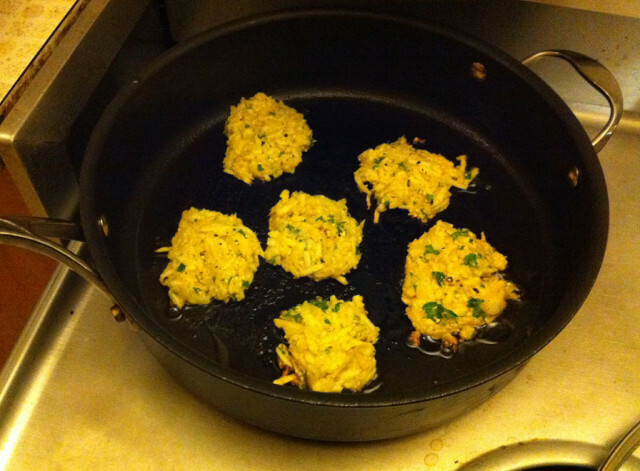 Here's a radical idea for a handmade holiday gift for the 21st century: make a meal of latkes. Making latkes, the traditional Hanukkah fried vegetable fritters, can be and often are a 100% handmade process – hand grate the vegetables, mix the unwieldy blend of veggies and matzo meal and eggs together by hand. Then again, modern tools and technology, from spoons to food processors, are also allowed, at least in my test kitchen. Not having grown up with a Jewish grandmother at the frying pan, I have no role models and no rules regarding latkes. 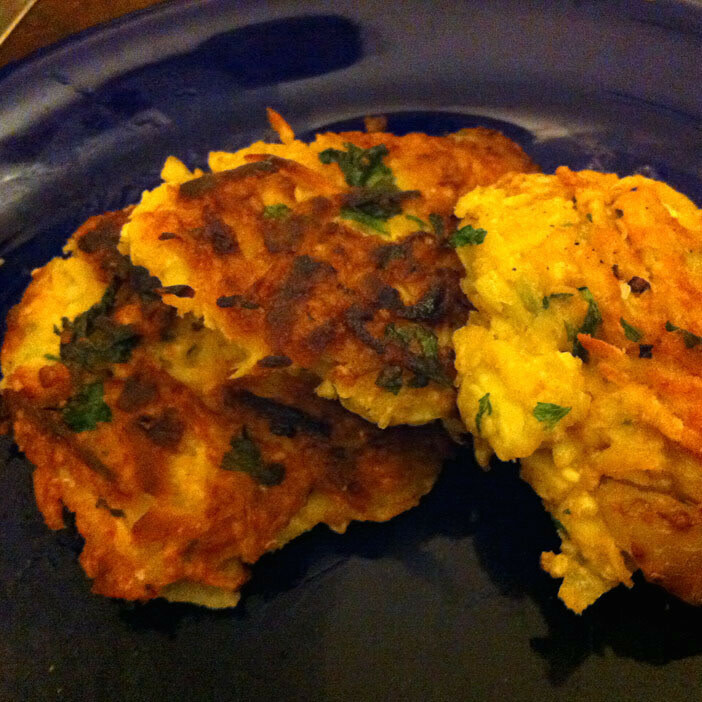 That freedom from tradition perhaps made it that much easier to try a non-traditional, non-potato recipe here: latkes made of parsnip and celery root. It was a good move. Melissa Clark suggests the variation on the traditional Hanukkah potato pancake, her recipe adapted for the New York Times from The Mile End Cookbook by Brooklyn restauranteurs Noah and Rae Bernamoff. The Bernamoff's and Clark's tweaking of the latke Hanukkah norm are well-considered and still satisfy the traditional holiday tastebuds. Clark also allows using a food processor, and says her mother gave her permission. But I agree with her that getting into the mound of grated vegetables by hand as you mix it all with the raw eggs actually does help speed and simplify the process. It's easier than a spoon, and lets you go straight to forming the patties between the palms of your hands. Then clean up! Place grated celery root, parsnips and onion in a large bowl. Sprinkle in matzo meal and toss mixture together with your hands. 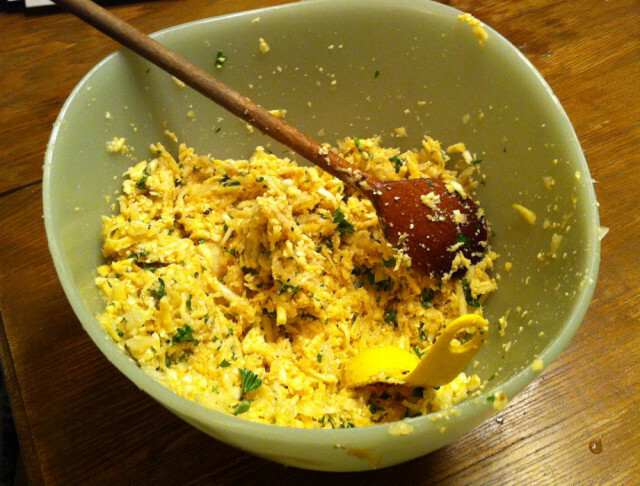 Add parsley, eggs, salt and pepper and combine again using your hands until ingredients are incorporated. Heat 2 tablespoons oil in a large sauté pan over medium-high. Take a heaping tablespoon of the mixture and flatten between your palms. Fry latkes, without moving them, for 4 to 5 minutes, checking that they don’t over-brown. (You should be able to fry them in batches of 11 to 12, depending on pan size.) Flip latkes, turn heat down to medium-low and fry another 4 minutes, or until well browned and tender. Transfer to a baking sheet lined with paper towels. Sprinkle with additional salt. Serve warm. Recipe adapted by Melissa Clark for the New York Times (from The Mile End Cookbook by Noah and Rae Bernamoff). Sauces and accoutrements are important. Strong and tangy flavors are traditional: sour cream, horseradish. A garlicky yogurt and beet dip is what Clark recommended. We used a sour cream, grated beet dip we'd had at Thanksgiving, and horseradish. Mix and mash as you go. It's all good, as your Jewish grandmother might say if she lives in Oregon these days.